inauguration that I urge boycotting tomorrow. This boycott is about all four branches of government that no longer serve the betterment of we the people. That’s correct, the four branches: the executive, the legislative, the judicial and (the one not specifically cited other than in the first amendment) the fourth estate. All four have failed us, the people. The executive branch has failed to use all the powers at its disposal for us. The legislative branch has failed to pass laws that were needed to get us out of the recession in a timely way and instead has focused in obstruction for political purposes. The judicial branch has failed to uphold the constitution. And most importantly, the fourth estate has failed to report the news choosing entertainment and ratings to factual reporting. All four of these institutions live in their own bubbles. This boycott on the 20th of January 2017 is meant to burst those individual bubbles and let them know that we will no longer stand for their failures to carry out their respective constitutional jobs “in order to form a more perfect union”. No elected official should leave their office richer than they entered. No news agency should be reporting unconfirmed news or possible news in order to improve ratings and their bottom line. Social media must address what their function is to be as part of the fourth estate. If they refuse to monitor what is published on their sites, then the federal government may need to provide guideline or enforce those that are already on the books. This needs to be a shot across the bow. The citizens of this country arewho they must serve; not their donors or advertisers. I urge all my fellow citizens to boycott all news related media tomorrow. Why are the federal and state governments facilitating the acquisition of military style weapons and equipment by local police forces? Basically, there is a movement in which legislation and policy are aimed at aiding the wealthy (like Congress) to increase their riches and power by taking from the poor, the working poor, women, the youth, the aged, and the middle class. The numbers affected by this sea change in wealth distribution are growing exponentially. The frustration and anger are growing exponentially. There will be a point where rage will erupt. The wealthy and the powerful have been careful not to attack the firefighters, the police and the army. They have been systematically preparing the national guard and local sheriffs and police departments to “handle” any protest which they will call insurrection. 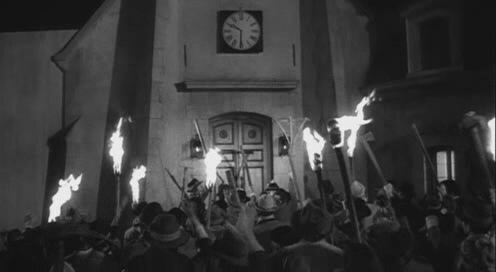 The one percent will be ready when the torches and pitchforks appear at the castle gate.